Adam Cianciarulo wins his second 250 Main Event in a row and takes over the points lead. 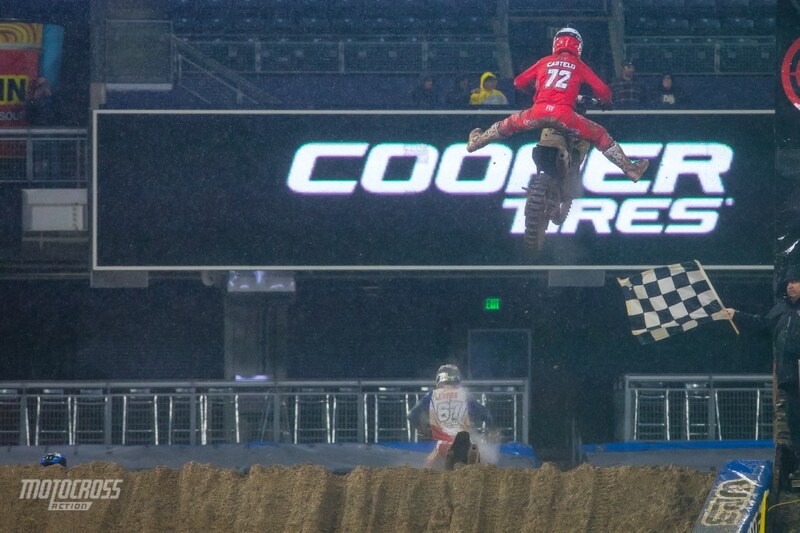 The 250 main event in San Diego was a pure survival race! 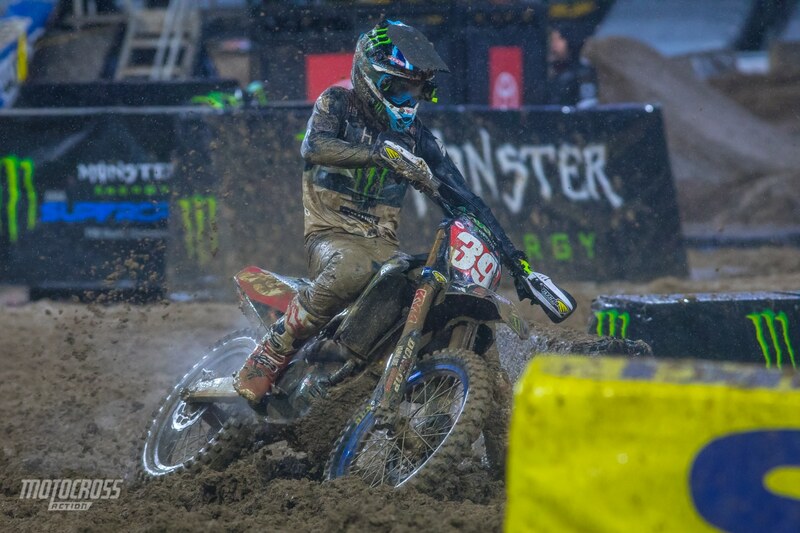 The track was ridable for the heats, but for the main event it was a whole new animal. 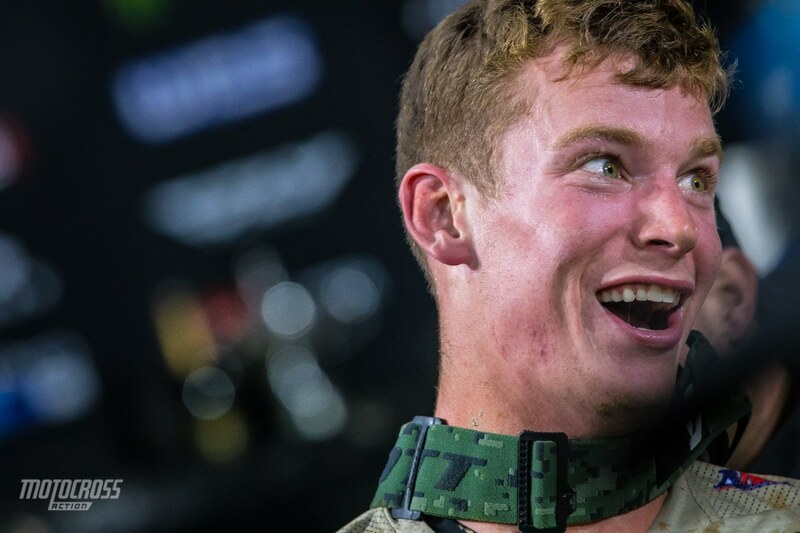 Adam Cianciarulo grabbed the holeshot and never looked back. But we can’t credit Adam’s win only to the start, he was truly the best rider on the track and he made it look a lot easier than the others. Adam’s Pro Circuit teammate Garrett Marchbanks rode awesome as well and he grabbed his first ever podium with a second place. 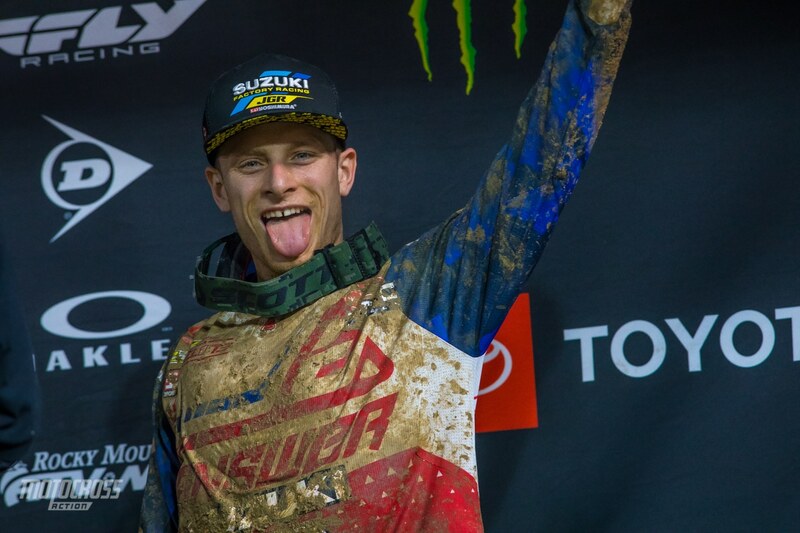 This is a huge deal for the rookie and he earned it, the Monster Energy Pro Circuit Kawasaki team must be stoked. 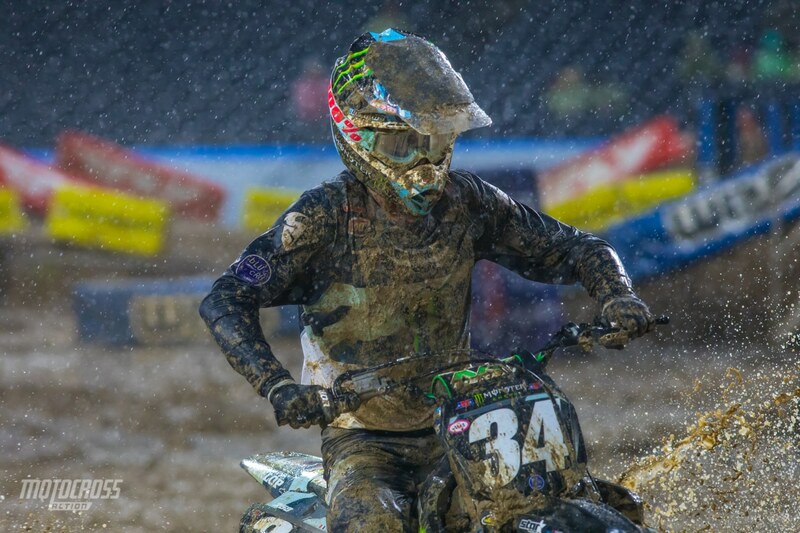 Adam Cianciarulo led the 250 main event from the gate drop to the checkered flag. Jimmy Decotis had an awesome ride, he finished on the podium in third. Dylan Ferrandis ran up at the front of the main event and he was sitting third on the last lap when his bike died with one corner to go. Dylan didn’t complete the lap and he finished seventh. We knew the Canadian would do well in the mud, Jess Pettis placed fifth! 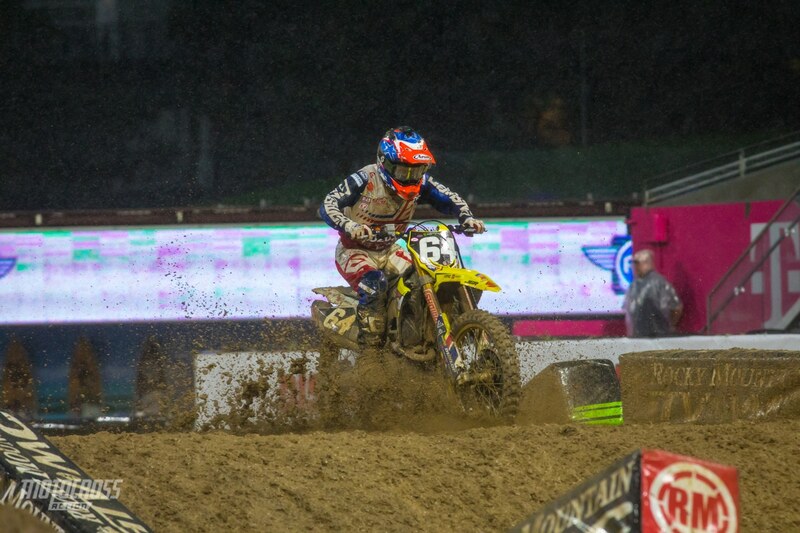 Martin Castelo had the best race of his Supercross career with a sixth place finish. 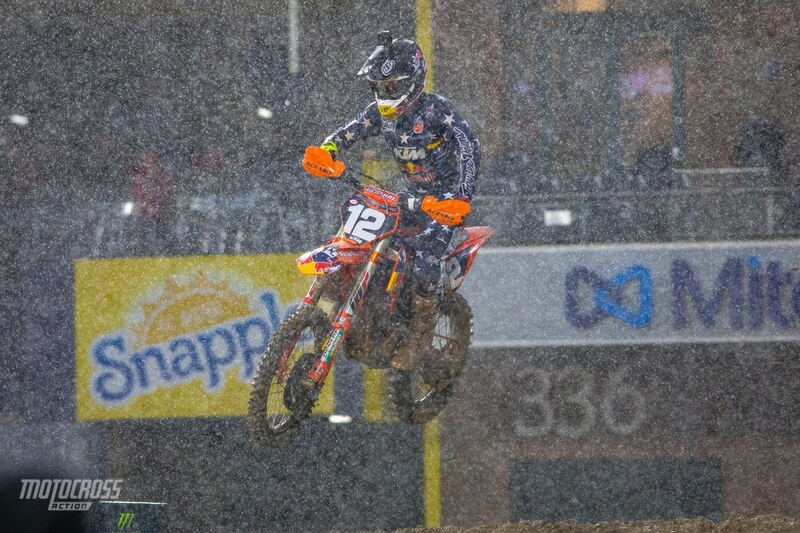 The mud race definitely shook up the point standings in the 250 class. 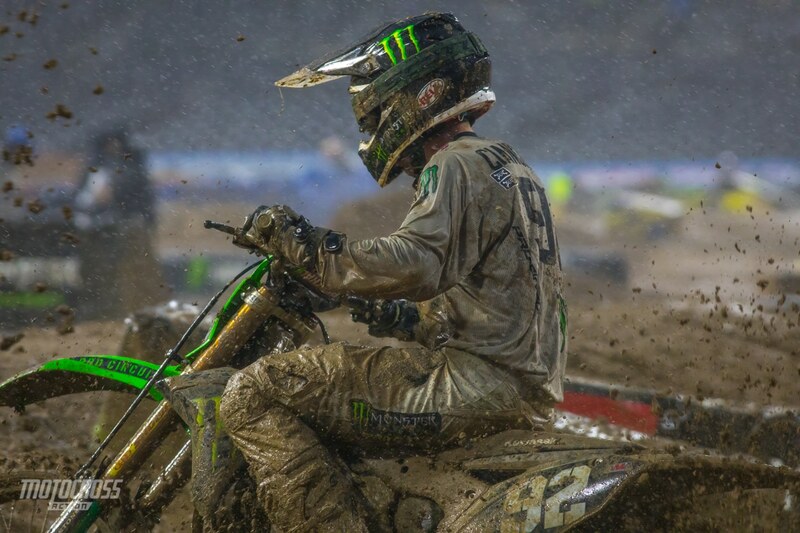 Adam Cianciarulo definitely used the wild card night to his advantage, he grabbed the win and the points lead. Shane McElrath salvaged some points tonight, after crashing on the first lap and sitting dead last, Shane passed up to fourth place. He now sits second in points, eight behind the new points leader. Colt Nichols had a rough race and finished tenth, he now sits third in the standings, ten points behind Adam. A tenth place finish in the main event dropped Colt Nichols to third in the Championship point standings. 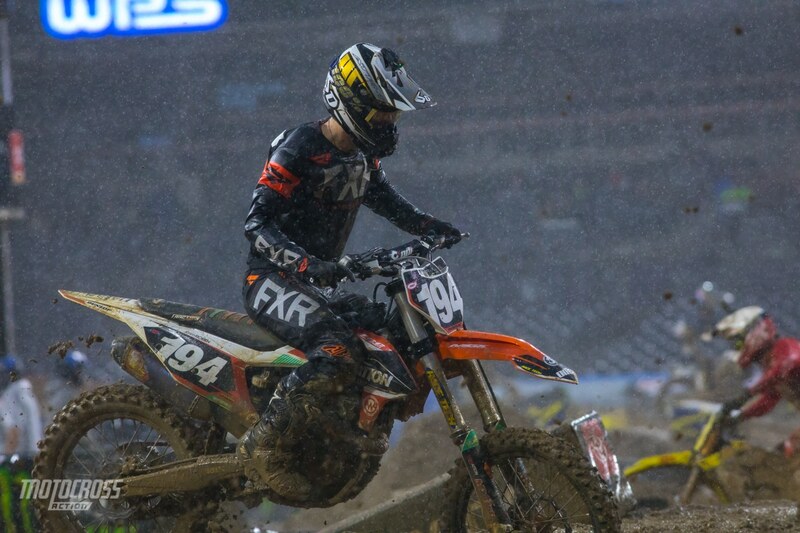 With the tough conditions tonight, the 250 LCQ was stacked with stiff competition. 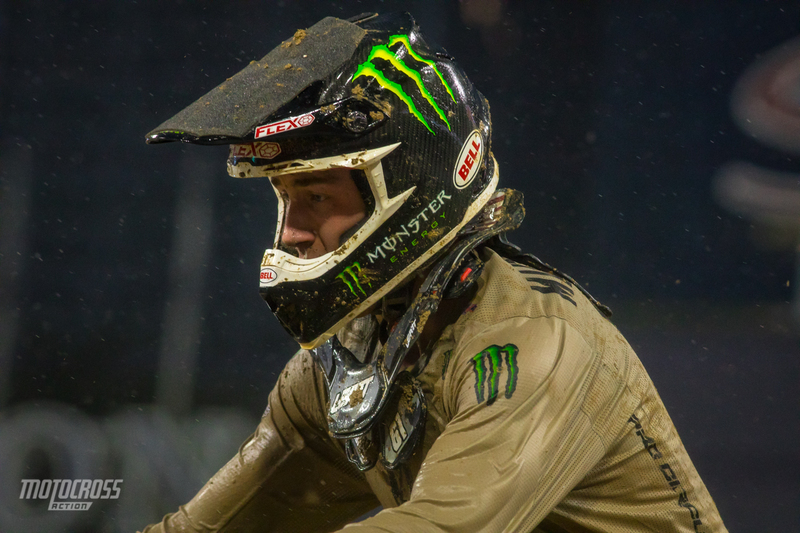 Garrett Marchbanks would win with Shane McElrath finishing second, Mathias Jorgensen third and Deegan Vonlossberg fourth. Up close on Garrett Marchbanks. The foam on his helmet is used to keep mud from packing up onto of his helmet and weighing him down. Many riders use foam during mud races and it does it’s job. 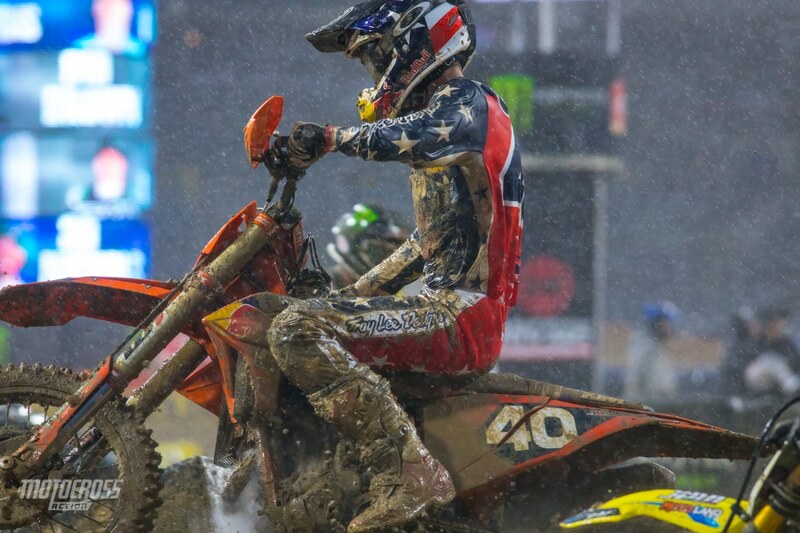 Shane McElrath finished second in the LCQ. The Southern California native, Sean Cantrell missed the main event by two spots. In 250 heat race 2 it was Rj Hampshire who got out front early and controlled the heat race. The track is getting worse and worse as the ruts are getting deeper and the transitions on the jumps are deteriorating. 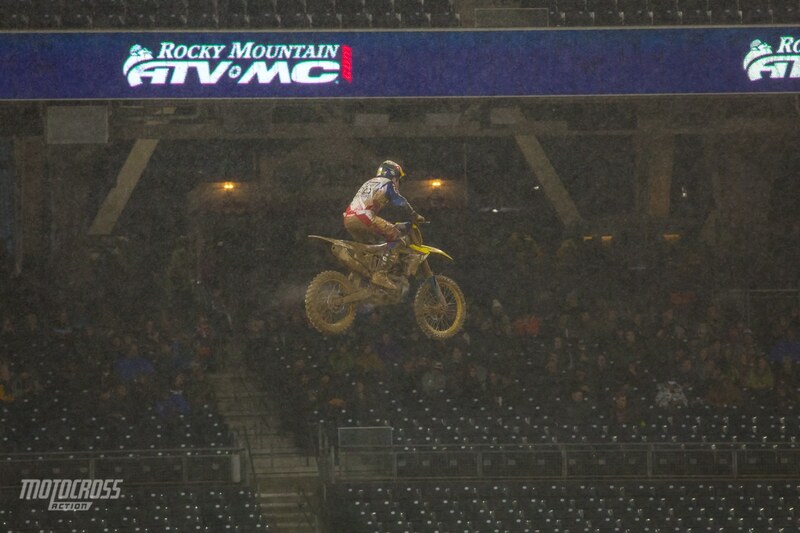 The start is always important in Supercross, but it is extra important tonight! Colt Nichols finished second in the heat. Jimmy Decotis finished third in 250 heat 2. 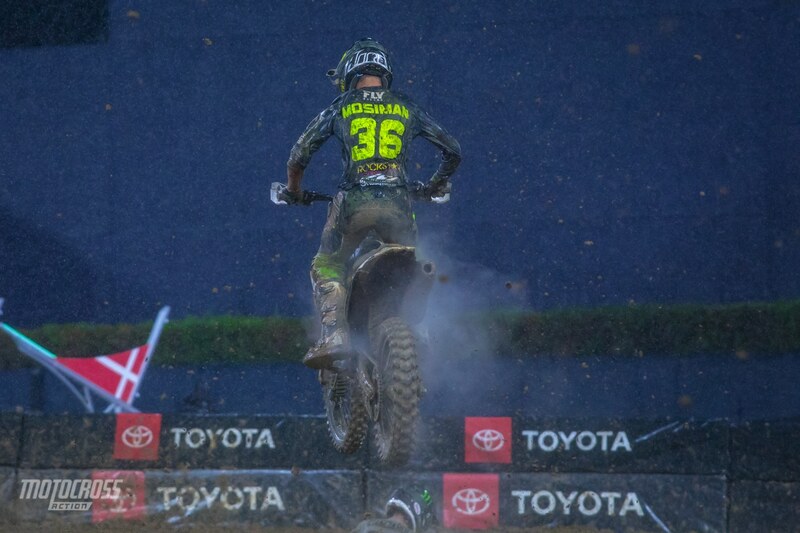 Michael Mosiman crashed on the start and came from the back to finish sixth in 250 heat 2. In 250 heat race 1, it was Dylan Ferrandis who grabbed the holeshot with the privateer Jerry Robin in second. 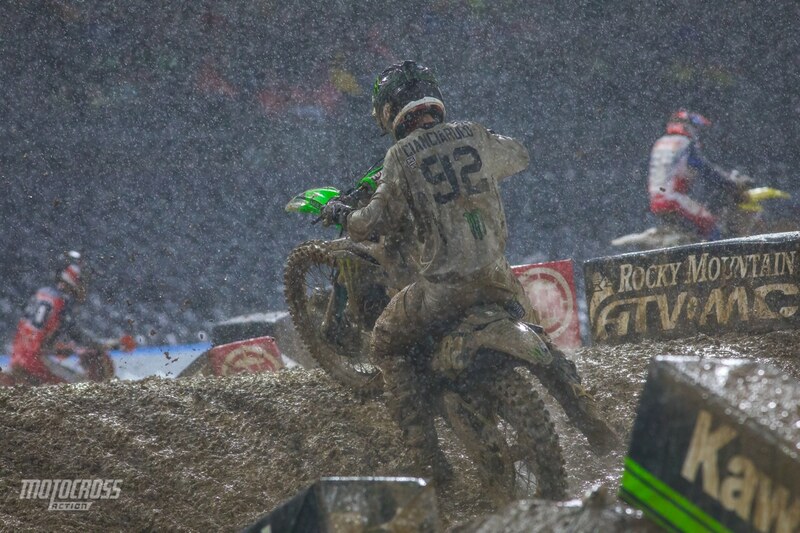 Unfortunately Jerry went down hard on the first lap and Adam Cianciarulo inherited second place. 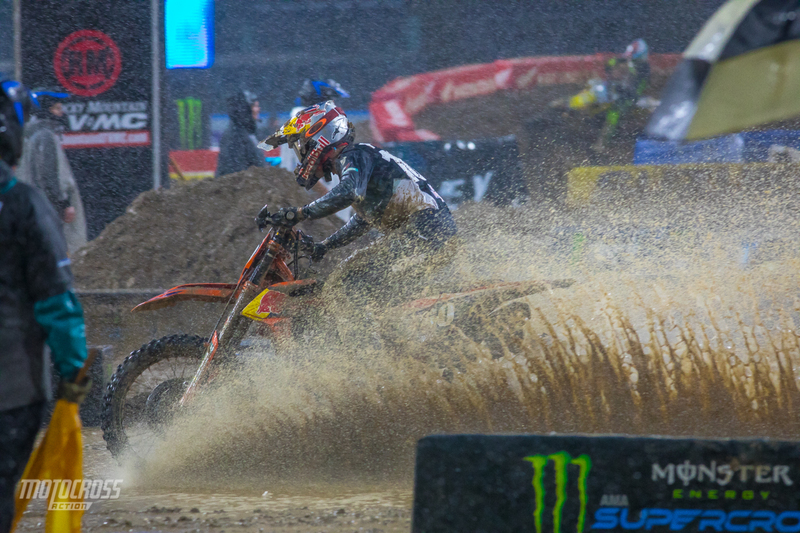 The track is insanely muddy and slick, but it’s not very soft. The track has a hard base to it and this is allowing the fast mud riders to clear most of the jumps! It’s crazy to watch and we are sitting on the edge of our seats. Adam Cianciarulo put on a hard charge to finish second in the first 250 heat race. He almost passed Ferrandis in the last turn. The privateer Jerry Robin had a great start and ran second place on the first lap before going down.